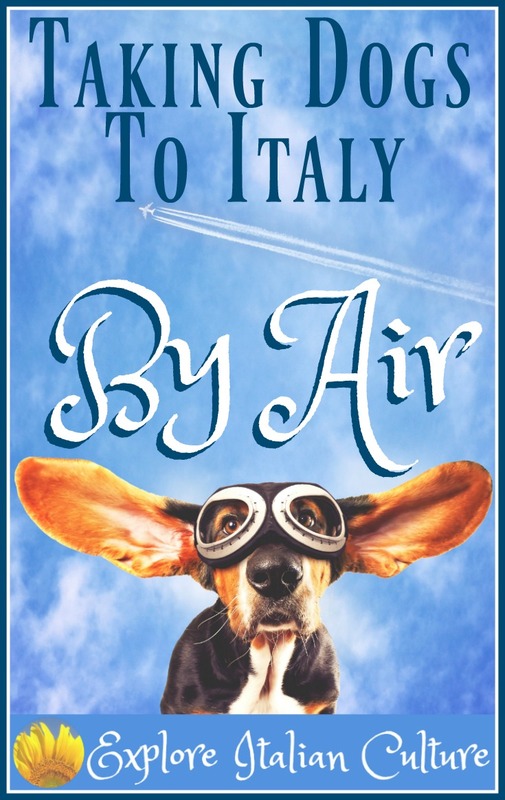 How to travel to Italy by air with your pet dog or cat. The rules and regulations about air travel for pet dogs and cats can seem confusing and overwhelming at first. In this article, we make sense of them so that you don't have to. You will need to make sure that your dog or cat meets the standard regulations for international air travel, and it's best to start that process as soon as you've made the decision to take your pet with you. Whether you're visiting from the USA, another European country or somewhere else entirely, your pet must be microchipped, must have had the anti-rabies vaccine and must have the necessary documentation. You'll find all the information you need about each of these critical areas by following this link. It will open in a new window so you can come back here easily once you're ready to take your planning to the next stage. Travelling by air to Italy with your pet: overview. The first stage in this process is actually to assess whether it's really necessary for your pet to travel with you, and if so whether travel by air is the best way to go. We cover questions you need to ask yourself, and possible solutions to potential problems, at this article about international pet travel. Take a look at it now, unless you are absolutely sure there's no other option available to you. This is a long article. Here's what we cover: click on any link to go straight to that section. Will your breed of dog be allowed to travel? Will your dog be allowed in the cabin? Dogs travelling in the hold. Travelling from the UK to Italy. Our Top Tips for safe pet air travel. This article covers general issues of travelling by air with your dog or cat. Airline regulations differ widely from one company to another, so your first source of information should always be whichever airline you intend to fly with. Step 1: Contact your airline. Not all airlines are permitted to carry animals, so before you even book your passage it's important you check that your intended company is licensed to carry your pet dog or cat on the route you intend to travel. Airlines generally have their pet policy on their website, so that's your first port of call when checking whether your pet will be able to travel with you. Don't only rely on the website, though. Contact them directly to double check. If you're certain that they do accept animals, either book your flights over the telephone or book online but follow up immediately with a telephone call to book your pet's place. If the airline doesn't carry animals, you'll need to find another carrier. Onward travel / connecting flights. Bear in mind that if you have a connecting flight, both airlines you're using need to accept animals. Wherever possible, book a journey with only a single flight. It's much less traumatic for your pet, and less complicated for you. Step 2: Check whether your dog or cat's breed is allowed to travel. Some air carriers will not accept certain breeds of dog and cat, classed as "snub-nosed", for travel due to possible breathing problems at altitude. Those breeds can include all types of spaniel, boxers, pugs, Pekinese, Shih Tzu and bulldogs; cats include Persian and Burmese. However, this list is by no means exhaustive. The "golden rule" applies here: check with your airline and, if possible, get in writing their permission for your cat or dog to travel. Bear in mind too the implications for your pet. It may be inconvenient, but airlines refuse some breeds for a reason. Check with your veterinarian to make sure flying with your dog or cat won't be putting him or her at risk. A note about "dangerous" dogs. Some countries refuse to allow entry to certain breeds of dog which they class as "dangerous". Italy is not one of them. Italian law accepts that any breed of dog is potentially dangerous, and places responsibility squarely with owner to ensure the animal is kept under control. So whichever breed you have, she or he will not be denied entry into Italy on the basis of "dangerousness". However, some airlines will not accept certain breeds of dog. Once again - check before you travel and ask your carrier about "restricted breeds". Step 3: Know whether your dog will be allowed in the cabin. All service animals are recognised as working animals, not pets, and are allowed to travel with their owners in the cabin. They usually travel free of charge. Most air carriers have a limited number of places for service animals, so they must be booked at the time you book your flights. For other dogs, however, regulations vary from one airline to another. Before you book your seat, find out whether your pet will be able to travel with you as carry-on or will need to travel in the hold. That information may influence your decision as to whether to take your dog or cat at all. Some - British Airways is one - do not allow any pets, no matter how small, to travel in the cabin. They must travel in the hold. Most other airlines allow cats and small dogs in the cabin, provided they are properly crated. How small is small? Generally this goes by weight. 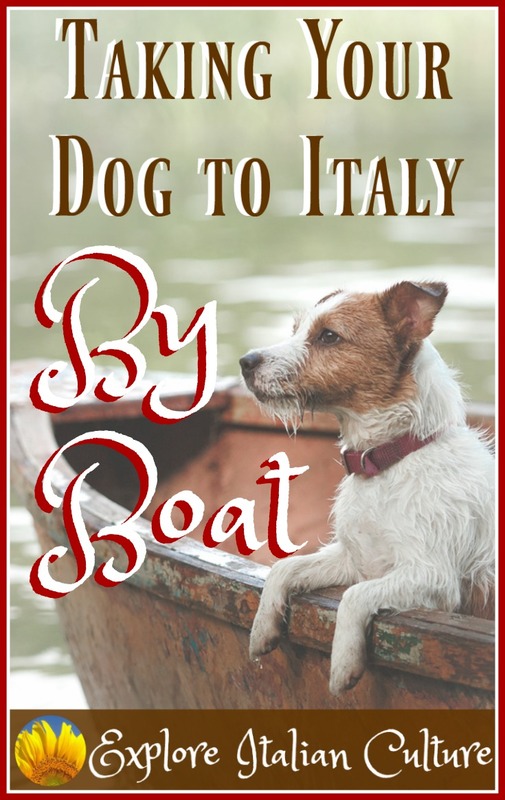 The "rule of thumb" is that a dog weighing less than 6 kilos (13 lbs) can travel in the cabin. Some insist that the maximum weight allowance should include the carrier. You know the drill by now: check with your airline. Where does your dog or cat go in the cabin? All international airlines will insist that your pet remains in its crate while travelling and that the crate remains under the seat in front of you. Your dog won't be allowed in the cockpit! Step 4: Know what happens to animals who have to be carried in the hold. Animals carried as cargo are placed in the aircraft's hold. The hold is properly ventilated, temperature controlled and pressurised. Animals are generally loaded onto an aircraft last and taken off first, to limit the amount of time they have to spend either in transit or in the hold itself. There is a separate compartment area for animals which is away from baggage - so Fido will not be sitting under a heap of suitcases! Although millions of animals are safely transported in the hold of aircraft each year, sometimes pets carried in the hold experience problems. If your pet has to travel in the hold, think carefully about whether they could remain at home. Ask your vet's advice if you're at all worried. Layovers and changing flights can be a particular problem: try to ensure you book a direct flight wherever possible. Step 5: Make sure your pet has an approved carrier for air travel. An additional cost is the expense of buying an approved carrier, whether your pet is with you in the cabin or travelling as cargo in the hold. Air carriers are not the same as the kind of carrier you might take your dog in the car with. Check out your airline's regulations. In both cabin and hold crates, there is a rule very strictly adhered to that the animal should be able to comfortably stand, turn around and lie down without the crate being opened. Make sure you buy your crate well in advance of travelling and allow your pet to get used to it in the house. Trying to force an anxious animal into a new carrier shortly before travel is asking for problems. And never, never use the air travel crate (or any crate, come to that) as a punishment. The crate must be able to fit under the seat in front of you and must remain there for the duration of the flight. It must not restrict the passageway of any passenger, and cannot be placed in the plane's exit rows. Air crate size restrictions vary from one airline to another. Always check yours before you buy. The crate must fit underneath the seat in front of you. The crate does not have to be made of hard materials - in fact, some airlines prefer fabric so that the carrier can be manipulated to fit under the seat. The animal must be able comfortably to sit, stand and turn around. Airline staff have been known to turn a pet away if they assess the carrier to be too cramped. After much research, we use the SleepyPod for Effie, our Yorkie. It's not cheap, but it's robust, it meets airline requirements and it allows her plenty of room to travel comfortably. Use a puppy pad in the bottom of the crate as well as a comfortable blanket, to avoid a wet crate on a long journey. Air crates for the hold. If your dog is to travel in the hold, the crate must be a hard-shell one, adequately ventilated. It must comply with the IATA regulations, which you can find at this link. It must have a waterproof bottom, no protruding handles and disabled wheels. It must have only one door on the front of the crate - not on the top. It must not be able to be unlatched accidentally. Many airlines now are insisting that air crates have metal, not plastic, fasteners so they can't be chewed through by an anxious pooch. Again, the dog or cat must be able comfortably to sit, stand and turn around. If the airline deems the crate to be too small, they will refuse travel. Be careful about measurements - make sure you look at the internal size, not external, or you may end up with a crate that's too small. An animal carried in a cargo crate must be comfortably able to sit, stand and turn around. For long journies by air, there must be access to food and water in the crate. The crate must be marked "Live Animal" and you should attach a plastic folder with the pet's name, your name and contact number, feeding requirements and any medical issues. Again, airlines have different requirements. Always check with yours before buying a crate. We never travel with a dog in the plane's hold, so we have no personal experience of hard shell crates. A crate like the one below is expensive, but excellent quality and could be worth it if you need to do a lot of air travel with your pet. It comes in a variety of sizes. Step 6: Cost of air travel for your dog or cat. With the exception of service animals, airlines will charge for carrying pets on their aircraft. 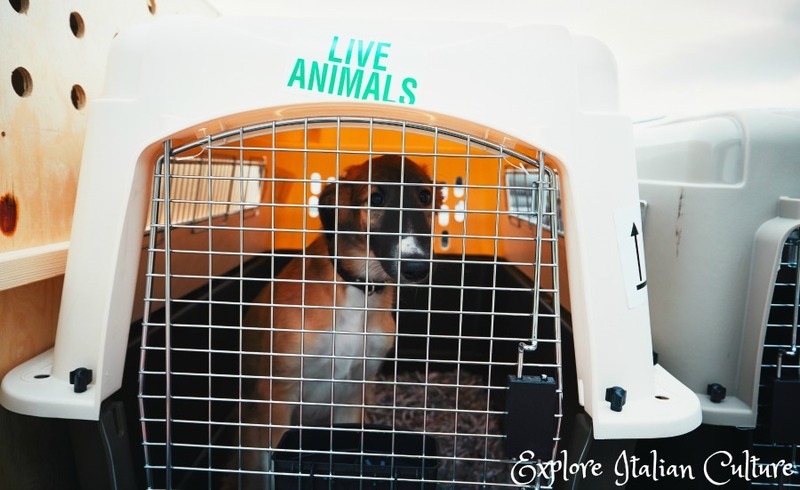 The cost will depend on the size of the animal and its crate, whether it's carried in the cabin or the hold (which requires additional services to ensure the pet's safety) and the journey itself. 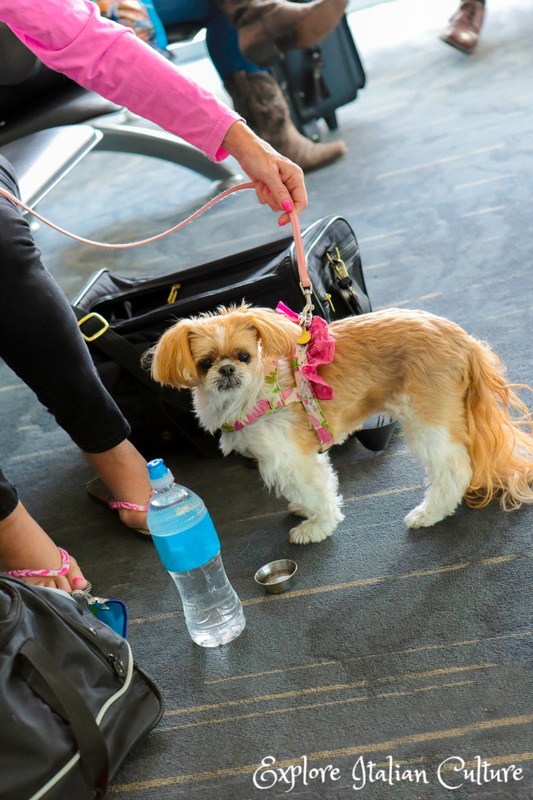 Connecting flights, for example, will incur additional costs as the pet has to be moved between aircraft and potentially kept safe during a longer layover. Travelling to Italy via the UK? 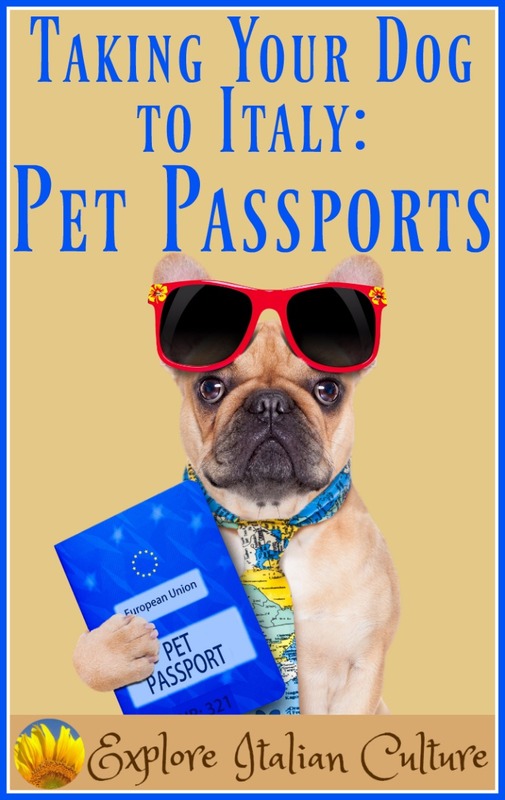 If you're intending to come to Italy via the UK, your pet will have to travel in the hold. No airline landing in the UK is allowed to have animals in the cabin. Some airlines insist that you use an agency to arrange travel to the UK, which can be massively expensive. Make sure you check before you book your flight. It can be much less of a problem to travel to the UK via another European country and to take the passenger ferry across the English Channel to the UK from France, Spain or Holland. That's the way we take our dogs between Italy and the UK. 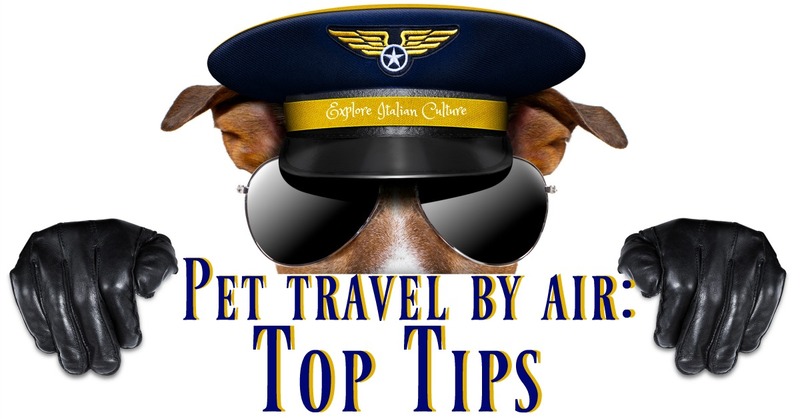 Our Top Tips for air travel with your pet. Choose your route carefully and if possible, make it non-stop. 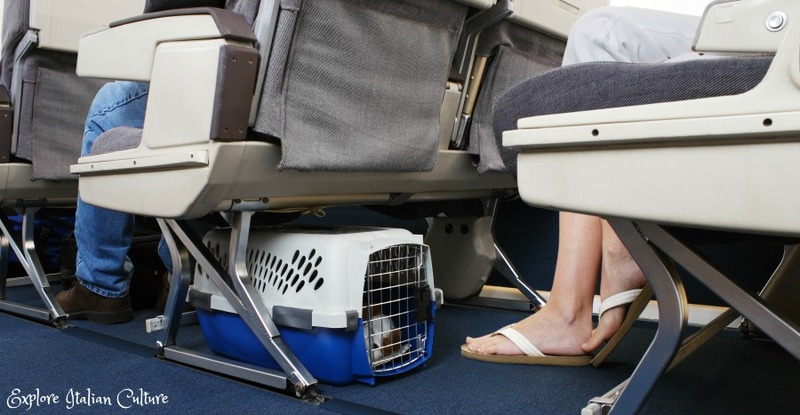 You don't want your dog or cat's crate to be standing on a hot runway waiting for the connecting flight (yes, it has happened). If you have the choice, travel in the Spring or Autumn (Fall) when the weather is less extreme - particularly if your pet has to travel in the hold. Once on the plane there won't be a problem - the hold is temperature controlled - but before and during loading, extremes of temperature can cause difficulties. Offer water just before boarding your flight. Always ring the airline when booking your flight to book the pet as well. Don't leave it - most airlines have limited space for dogs and cats. Check the airline's procedures for checking in your pet before you travel, so you know exactly where to go and how long you need to allow. If your dog or cat is travelling with you in the cabin, you'll usually be able to keep her out of the crate until your flight is called. Make sure you take advantage of any pet relief and exercise areas, and offer water just before boarding to ensure she is properly hydrated. Do not tranquilise your pet. Medication can cause sickness and breathing problems. Some airlines will refuse to board an animal which has clearly been medicated. Try a natural pet remedy instead: lavender is particularly good for calming. As well as puppy pads and a blanket in the crate, add something of your own so your pet has a familiar, comforting smell. This can help keep her calm during the flight. Flying dehydrates pets as well as people. A few days before you're due to fly, make sure your pet is given extra water. We use ice cubes which our dogs love to crunch! If your dog is in the cabin with you, offer some water during a long flight. If s/he is in the hold, ask your airline before you fly whether you will be allowed to leave a travel bowl of water in the carrier. This should not be a problem - in fact most airlines insist on it. Once on board, ask the flight attendant to confirm that your dog or cat has been loaded if s/he is travelling in the hold. It will help you relax during the journey. 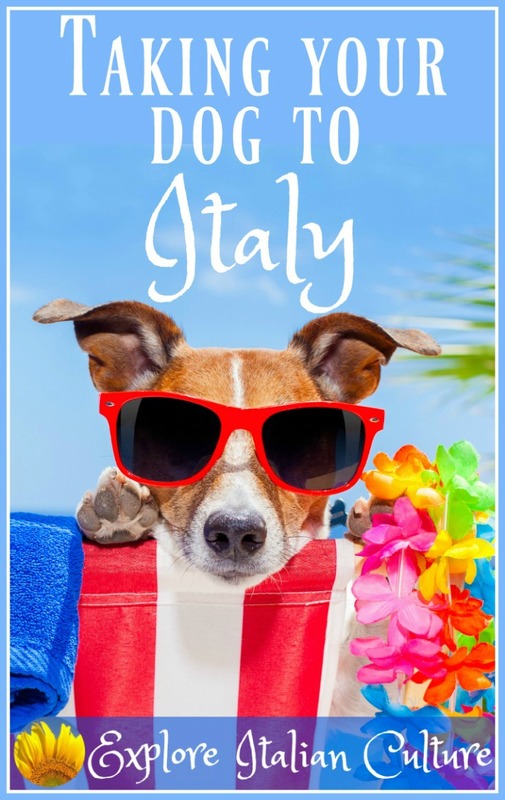 More information about travelling with your dog in Italy.